ON the morning of the 4th of July last H.M.S. 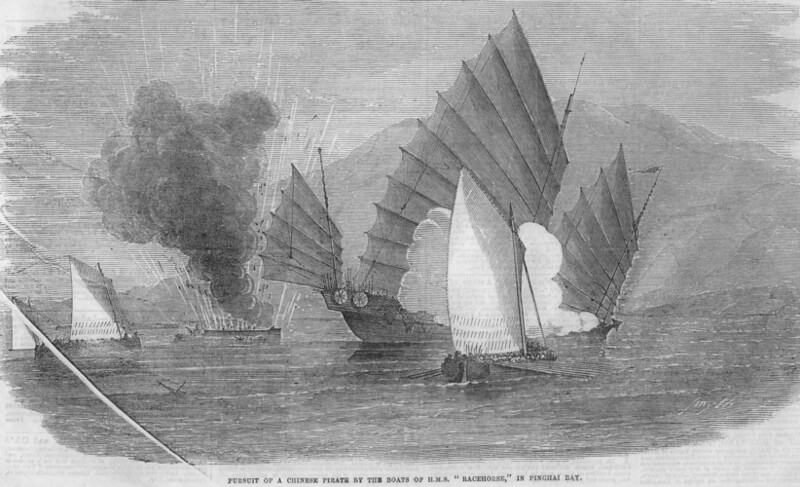 Racehorse, Commander Edward K. Barnard, on her passage from Amoy to Foo-chow, when standing towards Lamyit Island, with a hope of falling in with the pirate fleet she had engaged so successfully a few days previously (having recaptured an English vessel and released a Chinese vessel in their hands, de­stroyed two of theirs, and taken and destroyed upwards of a hundred of the pirates), observed a piratical vessel under the land, and chased her. Preventing her from joining seventeen of her comrades, which we subsequently observed at anchor in such shallow water that we could not approach near enough to attack them, we followed her into Pinghai Bay, where we anchored. Immediately the boats were sent in chase. The gig and two cutters got away first, followed her round the bay, pulling and sailing. Shortly afterwards the pinnace shoved off and steered a course to intercept her. After a spirited chase of about an hour, the pirate firing occasionally, the gig laid her bow in to board, when a shower of spears and stinkpots was thrown into her: the latter caused her magazine to explode, blowing two marines out of the boat, and obliging the rest of the crew to jump overboard. Shortly afterwards, the pinnace, by dint of yawing, was enabled to bring her 12-pound howitzer to bear; and, making exceedingly good practice, obliged the pirate to run on shore. Out of a crew of about sixty, forty were destroyed—the remainder escaped among the rocks. The crew of the Racehorse having burnt the pirate, the boats returned. In the gig there were four dangerously wounded (two since dead), two seriously, and one slightly.